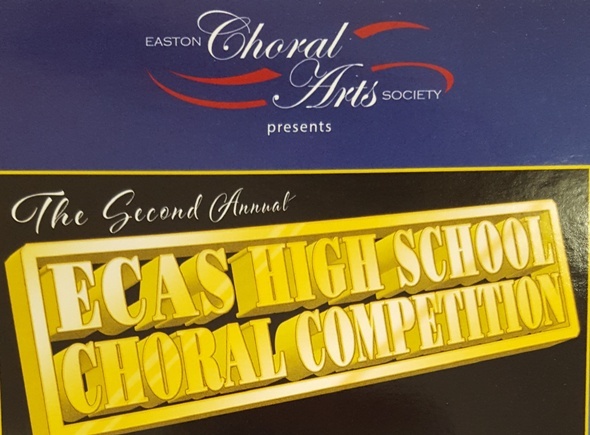 Easton Choral Arts Society presents their second annual ECAS High School Choral Competition. Come out and enjoy the program as eight finalist choral ensembles compete for three prizes. The competition, under the leadership of Artistic Director Wes Lockfaw, will be adjudicated by Dr. William M. Folger of Salisbury University, Dr. Devonna B. Rowe of University of Maryland Eastern Shore, and Dr. James Wilson of Wesley College, Dover. Performances take place 1:00 p.m. – 4:00 p.m.
Tickets are $10. Students are free. Tickets can be purchased at the door or at eastonchoralarts.org. The Mission of the Easton Choral Arts Society is to bring great choral masterworks programs to audiences of all ages on the Eastern Shore of Maryland. The organization’s vision is to contribute to the cultural life of the community by providing a volunteer organization to local singers of all ages who are committed to the challenge of choral music repertoire study and quality public performance. Easton Choral Arts Society believes in the power of music and its ability to meaningfully contribute to a rich and satisfying life experience for mature and young people alike. Learn more about ECAS at eastonchoralarts.com.